I have the NI RIG 5, IK Multimedia Ampeg, S-Gear 2. The tool sounds very warm and makes the experiment imagination. A good Idea from you!!! Cool! How about emulations of Elysia products? That would be a good idea for the future :-). Its Finally nice to see other People that don't appreciate these plugs. I demoed them Before from Softube. I can say the UA Versions sound exactly like the others. But to me that sounds bad. I really wanted Bass amp room to be awesome, but the only way to get a clean tone is to use the DI? I want the sound of an Ampeg SVT into the 8X10 Cabinet. Comon UA! I know you can do better! I've been a long time user of amp and effect modeling from the long time makers of that line of products (Line 6, Amplitube) and this is a very good sounding set. I like that you can bypass the amp or the cab model. I had a 24 track mix using other modeling and did a test switching over to these and the sound was very good. However using an Apollo Duo, UAD Duo, and Solo I maxed out on resources for tracks already recorded so to save resources in the future I will definitely use the Apollo to record the tracks wet and save the processing for the Studer/Ampex and other processors. Also would be nice if they sold each set separately as I don't usually use any metal type amp sounds. That's it really. For a guitar modelling plug with a straightforward interface and a killer sound, this doesn't even come close to Preflex + Gate Comp. In absolute terms, it's a decent enough offering, but Universal Audio already had this one nailed...at least for guitar. Outstanding plug in. This plug in rocks. Long overdue. Well worth the wait. Super practical and easy to use. Lots of fun. Gets everything rolling without much effort. Great visuals and explanations. It really ROCKS! Happy again :) we really need this. The most wickedest plug for a guitar amp. Love this thing. This is the benchmark for amp emulation? I've loved these amps for years. Lots of flexibility and they sound great. Amp Room sounds great ! The key to getting a great sound from the Amp Room Bundle is to be easy on the input as I noticed some negative reviews, I am really happy with this bundle and use it often for keeper tracks, also fantastic for bass ! Indeed and outstandingly uaudio as dun it again and keep doing great things, well I have previously bought softube bass amp. Works perfectly, with the ability to adjust the mic to any position is great. To find the same abilities with the gtr amp is very comforting, I have had my eyes on this good amp for a while, I have used logic gtr amps just to get a good verb mix and a light amp feel, but putting the soft tube at the end is extremely powerful, I needed some thing that could give me the final and real feel of an solid amp, it's indeed the final word I always want in my mixed. That uad rich amp final sound and the end of my gtr mix. Is indeed the final word in my mix, as always that's my anolog rich sound I need, putting uad plug ins, soft tub bass amp or gtr amp to be the final word in my. Mix is a perfect touchdown. Well dun uad for making my mixes shine like a ⭐️ star! Les graphismes sont un peu ancien mais le son est là. Il ne paraît pas très impressionnant au départ mais il est surtout immédiatement exploitable dans un mix. Pour l'instant c'est le seul plugin que j'ai testé qui permet d'avoir instantanément un son naturelle et exploitable dans le mix avec en plus des réglage simple. Les autres plugin doivent être combiné avec des simulateurs de baffle d'un autre plugin celui là est autonome. L'idéal serait que softube sorte d'autre plugin de la série amproom pour varié un peu plus les plaisirs. 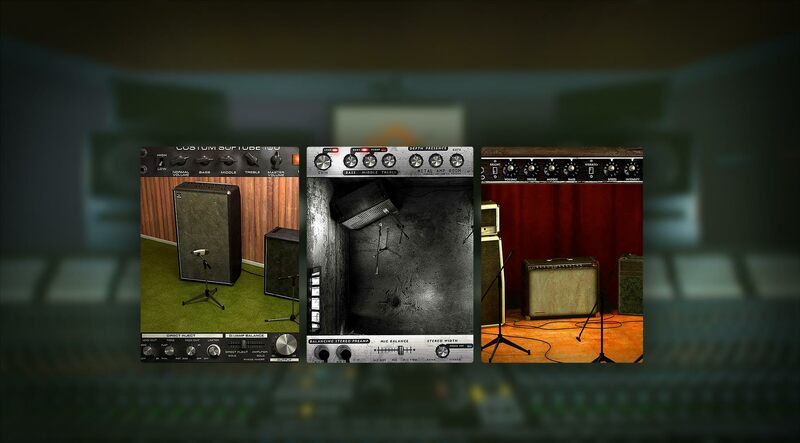 Great way to get the tone you need for your guitar tracks. I find that the ability to adjust the mic gives a bit more control over the shape of the sound. It’s nice to have a few amp variations to choose from when you want to A/B. The sims have a “real” tone and have been getting a good response from clients. It’s nice to have these in the toolbox and be able to put them to use when I need to use the DI track in the mix. A great addition to my UA arsenal of plugins! I am a guitar player myself and love the guitar plugins UA offers! Will be back for more! A avoir absolument dans son arsenal !!!!! Très bon set, il maque juste sur le Metal Amp Room la possibilité de gérer le gain de sortie.